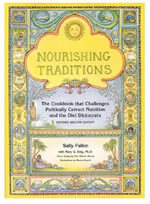 Nourishing Traditions: The Cookbook that Challenges Politically Correct Nutrition and the Diet Dictocrats is written by Sally Fallon, who is a nutrition researcher and president of the Weston A. Price Foundation. In this book Fallon asserts that modern food choices and preparation techniques represent a dramatic change from the way that we have nourished ourselves for thousands of years and as a result we are seriously compromising our health. She proposes the idea that the nourishing culinary traditions of our ancestors are the key to good health and should serve as the model for contemporary eating habits. The dietary suggestions made by Fallon are based on the research of Dr Weston Price who studied traditional diets. He observed that when cultures ate their native diets they were free of chronic disease, dental decay and mental illness. Without exception when they commenced eating a modern processed diet all of the protective effects were lost and their incidence of these conditions were the same as that experienced in the rest of the modern world. One of the major points highlighted by Nourishing Traditions was that almost all of the traditional diets included seafood, organ meats or dairy products. Animal fat was valued as playing a primary role in supporting good health. As such, Fallon argues that we actually need animal fats in our diet, which is strongly in contrast with the common advice that a low fat, low cholesterol diet is the best for our health. She supports her statements with scientific research that brings into question the proposed negative effects of saturated fats that are claimed to be the cause of chronic disease by many health authorities. However, Nourishing Traditions emphasizes that it is of vital importance that animal products are of the highest quality, organic, and free-range. Dairy products also should be raw and unpasteurized. It is also recommended to consume raw eggs, fish and meat on a regular basis. Fallon highlights the importance of traditional methods of food preparation because they can actually increase the nutrient availability of fruits, vegetables, nuts, grains, meat and dairy products. Techniques such as making bone broths, fermenting vegetables and milk and soaking nuts and grains are utilized in many of the recipes. Fresh fruit and vegetables, organic meat and poultry, fish, eggs, raw dairy products, fermented vegetables, homemade bread, whole grains, legumes, honey, maple syrup, coconut are used in Nourishing Traditions Recipes. The book does not include exercise advice. Nourishing Traditions retails at $25. Discourages the use of refined grains, sugar and artificial sweeteners. Offers suggestions for those with limited time or a limited budget. Not targeted towards weight loss. Diet could easily become too high in sugar and fat if not planned carefully. Many of the recipes involve long preparation times. Raw animal products carry a risk of bacterial contamination. Nourishing Traditions questions many of the currently held beliefs regarding nutrition and supports the arguments presented with compelling evidence and scientific research. Fallon offers many valuable techniques and suggestions to increase the nutritional quality of the diet. However, Nourishing Traditions does not provide adequate guidelines in regard to creating nutritional balance, especially in relation to the treatment of specific health conditions.